Unlike the rest of his brothers, Mario Maserati was not that into car racing. However, what talent or interest he lacked in racing cars was replaced by his artistic ability. His brothers asked Mario to create the Maserati log, so he created its now famous trident logo. The Maserati hometown of Bologna features a famous statue in the Piazza Maggiore, the Fountain of Neptune by Bartolomeo Ammannati. Neptune was the Roman god of the sea, and he always held a trident, which is also a symbol of strength. The design incorporates red and blue colors because they are the same colors as the banner of the city of Bologna. 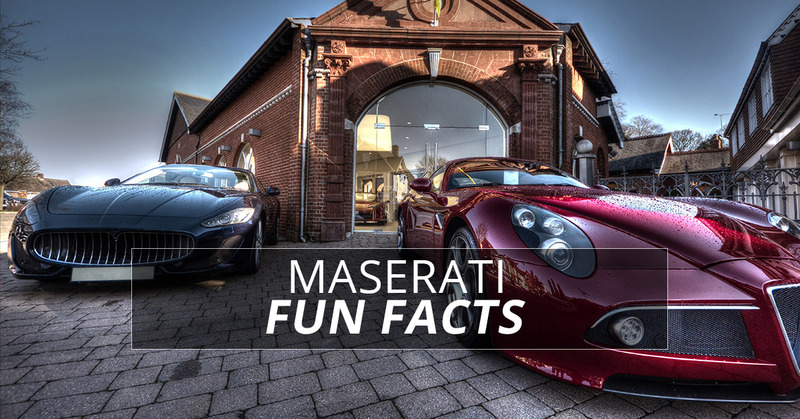 As Maseratis gained more visibility, the company became known for its powerful engines. In fact, Count Theo Rossi liked Maserati engines so much that he bought two used Maserati V16s. Instead of putting these engines in cars, he used one of them to power his boat. Hydroplane racer Cantieri Timossi used a Maserati engine in his vehicle and won the hydroplane world championship in 1958. During World War II, Maserati halted its production to focus on the war effort. The one exception was the car that Mussolini commissioned Maserati to build. According to legend, Mussolini wanted a personal car that was faster and cooler looking than Adolph Hitler’s Porsche. However, Mussolini decided to terrorize the nation in an Alfa Romeo instead, ending the Maserati project. Today, Maserati and Ferrari are joined under the Fiat brand, but they used to be enemies. The rivalry between Ferrari and Maserati began in the early 1950s, starting a torrent of trash talk on both sides. Italian President Sandro Pertini used a Maserati as his personal car in 1978, which rubbed Enzo Ferrari the wrong way. In fact, when Pertini stopped by the Ferrari factory in Maranello, Enzo turned him away because he was in a Maserati. Ouch. The Shah of Persia from 1941 to 1979 was Mohammad Reza Pahlavi. And he loved Maseratis. Maserati custom built a car just for the car aficianado with a personalized engine and chasis. Featuring rare wood and gold, the interior was as stunning as the rest of the car. Are you looking for the most reliable Maserati diagnostic tool? Our diagnostic car tool works wonders with Maseratis. Our car scanner software features an exclusive package specifically designed for Maseratis. Contact Leonardo Diagnostic Tool for more information today.